[F] Fixed rain sensor trigger condition. [F] Fixed optifine gauge model issues (thanks mike linn). - v1.1.3    [R] Release build. [F] Glass ambient occlusion fixed. - v1.1.3-b1 [F] Fixed cyclic switch destruction issue. [A] Entity detector switches can now also trigger on objects/items. [A] Tile entity name data fixer added (for version transitions). - v1.1.2    [R] Release based on v1.1.2-b2. it was overdue to keep this away from the server). 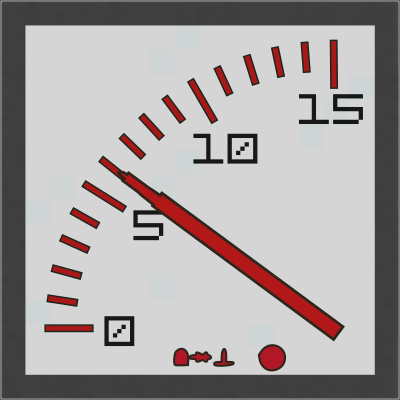 [A] Added gauges color tinting support (left click with dye like switches). [A] Added industrial, color tintable, white LED indicator (dye left click). [A] Added rustic flag semaphore indicator. - v1.1.2-b1 [A] Added Cased switch link receiver (bistable, silent, full-block). [A] Added Cased pulse switch link receiver (pulse, silent, full-block). [A] Manual dimmer switch added (industrial vertical slide, 0 to 15). [M] Switches and gauge do not get washed off by fluids. [M] Faint config click sound added (applies to all switches). - v1.1.1    [R] Release based on v1.1.1-b2. - v1.1.1-b2 [M] Recipe of glass gauge changed to be crafted with a glass block. to the entity detection switch. [M] German language file updated. (update of affected blocks only). mode and configuration of many switches). - v1.1.0    [R] Release based on v1.1.0-b4. opt'ed out features (for trouble shooting and development). [A] Added with-experimental opt-in config. [A] Added mod specific registration and config based recipe condition. [M] Indicator state range reduced (RAM/performance optimisation). [M] Internal changes to prepare future mod features (see repository). - v1.1.0-b2 [A] Added switch link relay (redstone power based link activation). [A] Added switch link pulse relay (reacts on redstone rising edge). [A] Added switch link receiver (silent bistable switch device). [A] Added switch link pulse receiver (silent pulse switch device). [A] Added yellow and red power plants (yes, flowers). gradle updated to v3.3, mappings update to version stable_39. [!] Forge deprecation fixes, THIS MAY AFFECT EXISTING SWITCHES. MOD CONFIG TO THE DEFAULTS. [A] Version update check (Forge update json file format). [A] Mod jar signing implemented. [M] Version naming compliancy (removed 'mc' prefix in version strings). [M] Forge naming convention refractoring of classes. - v1.0.5    [R] Release based on v1.0.5b2. [A] Added inverse output state switch linking feature. - v1.0.5-b1 [A] Added switch linking subsystem. can be link sources and link targets. and target (only the most insensitive one). standby to run mode the switch resets internal values). - v1.0.4    [R] Release based on v1.0.4b2. when items or any entities fall through). - v1.0.4-b1 [A] Added switch status message overlay (replaces chat messages). [A] Added industrial shock sensor contact mat (fall-on detector). [A] Added rustic full size contact plate. at the first double click, after that the config is cycled. the config and then optionally change it. AIR and any liquid now, not just for air, water, lava. [M] Switches are attachable to pistons, and pop off when pushed. - v1.0.3    [R] Release based on v1.0.3b6. - v1.0.3-b6 [A] Added inverted redstone sensitive glass (light emitting). [A] Added touch configurable glass contact plate. [A] Added glass infrared motion detector. [A] Added glass linear laser detector. [A] Added glass daytime switch. [A] Added glass interval timer switch. [M] Enabled glass switch color teaching (dye-left-click-tinting). [A] Added German language file, too. to Dave for posting this on github (issue #6). - v1.0.3-b4 [A] Added glass bi-stable, pulse, and contact switches. [M] Changed sensitive glass textures. - v1.0.3-b2 [A] Added mod specific creative tab. [A] Added rustic floor contact switch UI texture. in mod options, feature for future use). [M] Improved industrial bi-stable switch 1 model. - v1.0.3-b1 [A] Added rustic wall gauge. [M] Improved industrial gauge models. - v1.0.2    [R] Release based on v1.0.2b2. - v1.0.2-b2 [A] Added "rustic" switch series switches. - v1.0.2-b1 [A] Added "old fancy" switch series. [A] Added "rustic" switch series (partial). [F] Fixed automatic switch iterative recipe. [M] Changed sensitive glass recipe. - v1.0.1    [R] Release based on v1.0.1b3. - v1.0.1-b3 [A] Added local light sensor switch. [A] Added rain sensor switch. [A] Added lightning potential sensor switch. [A] Added (day) timer clock. [A] Prepared translation/localisation for text messages. - v1.0.1-b2 [A] Added bistable mechanical/retro style hopper blocker switch. [A] Added bistable mechanical/retro style rotary lever switch. [A] Added bistable mechanical/retro style lever switch. [A] Added pulse mechanical/retro style pull switch. [A] Added pulse mechanical/retro style push switch. [A] Added pulse mechanical/retro style double pole push switch. [M] Changed ring-fenced-pulse-switch front texture. [F] Fixed localisation name of arrow target pulse switch. [A] Added configurable sensor (linear range automatic switch). [A] Added configurable door contact mat. [A] Added sensitive floor contact mat. [A] Added fenced pulse switch. [A] Added arrow target pulse switch. [A] Added alarm siren (sound indicator). (but not the fenced one). - v1.0.0    [R] Release based on v1.0.0rc4. [M] Final recipe tuning (gauge and lamp indicator). - v1.0.0-rc4 [M] Performance improvements, startup screen config options added. [F] Fix: Network client: Gauge display zero when hit or activated. - v1.0.0-rc1 [A] Initial feature complete version.